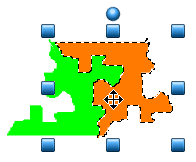 Students can use the paint tools in Wixie and Pixie to create their own reflection tessellations. Launch Pixie or log in to Wixie. Start by drawing a filled triangle. To do this, click the Paint button on the toolbar. 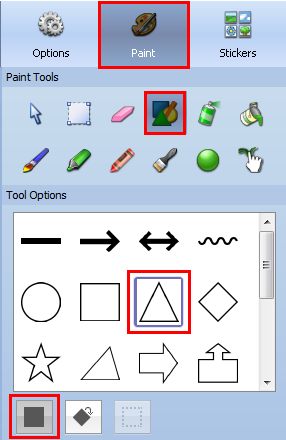 Click the Shapes tool. Click the triangle. Make sure the solid fill option is selected. Choose a color from the color palette. Move the cursor over the page. Press and hold down the Shift key on the keyboard. Click and drag across the page to draw an equilateral triangle. Click the Selection tool and the Lasso option on the Tools panel. Click and drag the lasso to select a shape from the triangle. Be sure to start and end on the vertices of the triangle. Click the Flip Vertical button on the Paint panel. Move the cursor over the middle of the selection. Click and drag it to the opposite side of the triangle. Line it up so the edges touch and there is no space between them. Use the Lasso tool to select this shape. In Pixie, click the Duplicate button on the toolbar. 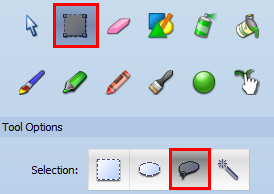 In Wixie, click the Edit button on the toolbar and choose Duplicate. Move this new copy to the side and use the Paint Bucket to fill it with a different color. Click the Flip Vertical button on the Paint panel to create a reflection of the original shape. Select one of the shapes with the Lasso tool. Go to the Options menu and choose Convert to Sticker. Repeat this process for the other shape. Line up the new copy next to the old so there are no gaps in between them. Continue duplicating these shapes to create your tessellation. 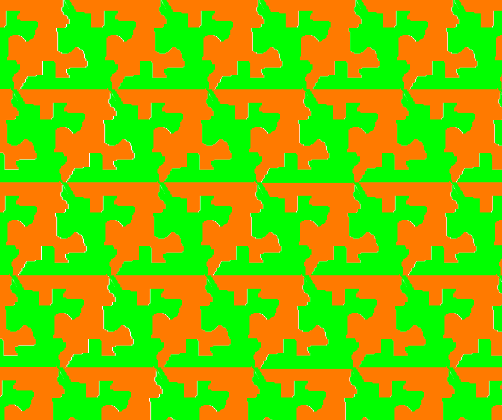 Print your tessellation or export it as an image to share online. Before you convert the shapes to stickers, you can also use the paint tools to add details to each shape to transform it into a more obviously recognizable object. You can find a lesson plan on making tessellations on Creative Educator! You can also download PDFs with directions for creating reflection tessellations in Wixie and Pixie from the lesson page. I had better stop before David and Dallas find out how much fun I am having drawing these tessellations. I swear I have the best job ever. Special thanks to Jennifer Weaver for taking the time to chat yesterday on a different topic and remind me that this has been on my to do list for a very long time!